On Wednesday, November 28 at 7:00 p.m. the Reading Public Library invites the public to learn about iMovie. 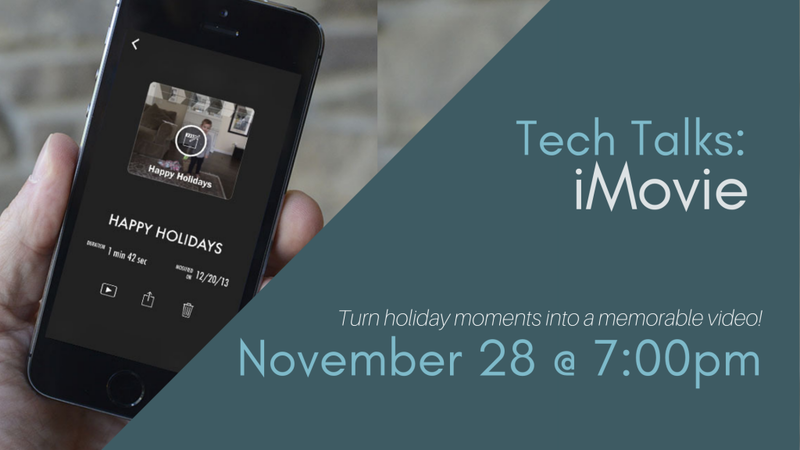 Turn upcoming holiday moments into a memorable video to share! Learn the basics of Apple’s premier video editing software, iMovie, including importing and editing in this demo class. We will demonstrate how to make a simple movie and cover topics including adjusting clip duration, applying special effects, adding titles and transitions, and saving and sharing the final piece. Though not required, attendees are encouraged to bring along a device with iMovie, such as an iPhone or Mac laptop, to follow along. No registration necessary. Free and open to the public thanks to the generous sponsorship of The Friends of the Reading Public Library. This lecture is part of the Library’s technology series, Tech Talks, which offers workshops and programs on technology advances. The Library welcomes your Tech Talk suggestions by email to rdgref@noblenet.org.